Each wave stressed the damaged ship, and John wondered how long she could last. He had often imagined how he might die. Perhaps it would be from some tropical disease in Africa or from wounds he received in a brawl with another seaman. Now John was sure he knew. He was about to drown in the North Atlantic Ocean, gone with no trace. 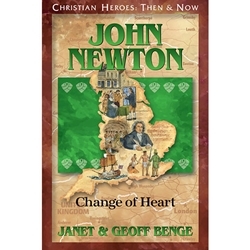 John Newton’s life was in a downward spiral. Impressed into the Royal Navy, John clashed with his fellow seamen and even became a servant alongside slaves in West Africa. When he found himself on a sinking ship, he called out to God for help. John began his conversion to Christianity while he captained a slave ship. Eventually he gave up his former life completely and became a minister with a deep passion for the gospel. A living witness to God’s ability to change hearts, John joined the movement to set slaves free and penned hymns of hope, such as “Amazing Grace,” sung by millions around the world today (1725–1807).